Yesterday's silly Facebook app asked "what kind of a life have you lived?" - and after two clicks I got my answer. There it all was: the past few years summed up in a few photos and a little rhyme, as catchy as an advertising jingle, which I rather like. The jingle would make a good caption for an advert for religious life - except that I'd say I've known happiness and pain rather than seen, which can sound somewhat remote. 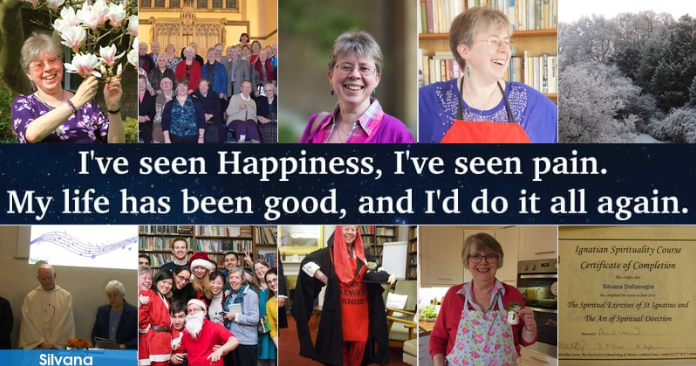 Because over the years I've definitely known happiness: the deep joy of experiencing and sharing God's love; the soaring, heart-bursting joy of making vows; the small, simple, daily delights of people, prayer and situations which enable me to grow and flourish and love even more. And I've known pain: the pain of bereavement and darkness and 101 disappointments; the angry pain of unjust situations and the helpless pain of being with someone in their suffering; the heart-piercing pain of encountering vulnerability, bleakness and despair; so much which is beyond my understanding and capacity, except for bringing it into the emptiness of prayer. And throughout and despite and because of all this, my life has been good, because it has been blessed in 1001 ways - and yes, most certainly, I'd definitely do it all again!